Performing a song that they wrote especially for TEDxSydney 2013, John Butler and Jeff Lang sing “Heading In The Right Direction”. Live in the Concert Hall of the Sydney Opera House. 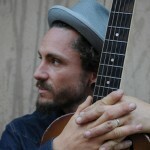 From busking the streets of Western Australia and becoming Australia&apos;s most successful independent artist ever, John Butler has taken his brand of roots/rock music to all corners of the world and remains an icon and inspiration for independent and socially active musicians everywhere. Australian-based musician Jeff Lang has earned worldwide acclaim as a virtuosic guitarist, a dynamic songwriter and a startlingly distinctive live performer. Blending rock, roots, folk, blues, ballads, instrumentals, improvisation and a devastatingly high level of musicality, Jeff Lang is a singularly unique performer in the world.